It’s all about the butter. Its all about the butter. Creamy, European style high fat butter. We, at Le fournil are fans of butter; we use 35 to 45 kg (80 to 100 pounds) of butter a week! As mentioned in a previous blog post – 10 Things you didn’t know about Le fournil, that’s the weight equivalent of an 8 or 9 year-old child in poundage of butter! Butter in Canada is regulated at 80 % milk fat. Our friends in Europe have it regulated at 82%- 84% and we’ve jumped onto their bandwagon. Lucky for us all, we were able to source a high fat butter in Canada. Sterling Creamery in Ontario produces an 84% milk fat butter. This high fat percentage butter allows for a lot more pliability when it’s cold. This is important to us for when we laminate and prepare our butter for our viennoiseries: the higher fat content creates consistent, even layers of butter. As we build our butter layers, they won’t break, which means an evenly tiered croissant with a beautiful honeycomb crumb and flakier crust. 84% butter requires more milk to make a higher fat butter and a more involved and complex process. As the quality of our raw materials is improving (we have also invested in a better flour, but that’s a blog post for another time), our costs have increased; as such, we have had to make some adjustments at the till. We trust you will agree with us that all this quality is worth it! On average, we produce around 300 viennoiseries a day! 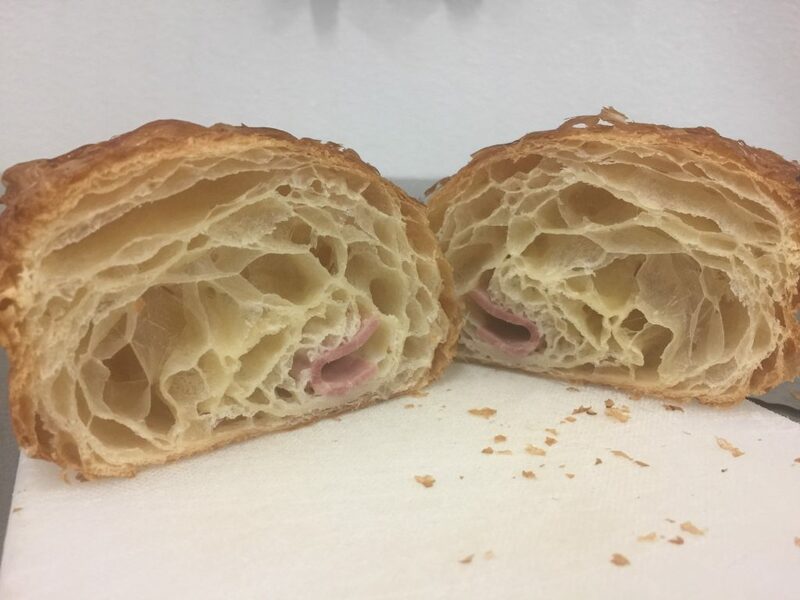 In effect, we product around 200 viennoiseries on quieter days, and close to 500 on busy days! It takes 36 hours from start to finish to produce our laminated dough products. We are proud of our upgrades! We hope you too will appreciate and experience the melt in your mouth, buttery goodness that we have for you. As artisan bakers, we are very proud to produce a high quality, locally made, rich in taste viennoiserie. Fresh daily! © - Le fournil Bakery | All Rights Reserved | Sitemap | Calgary Wordpress Experts - Design by Creative Elements Consulting Inc.